Steel material, durable and heavy-duty. The polyurethane wheel performs well on most surfaces, and excels on hard surfaces like concrete,tile,and wood. Ball bearing Rollers which offer maximum rolling ease and requires less effort to start rolling and keep rolling. The locking mechanism not only lock the wheel from turning but locks them from rotating. Chemically bonded onto heavy-duty Steel wheel centers,non-sparking, non-conductive,impervious to oil, ozone, grease and most solvents, and will not mark floors. Installation screws NOT included as various installations would require various sizes and types. 100% lifetime warranty!If you have any question,please contact us. We will reply in 24 hours and 100% money back or replace new if you are not satisified! 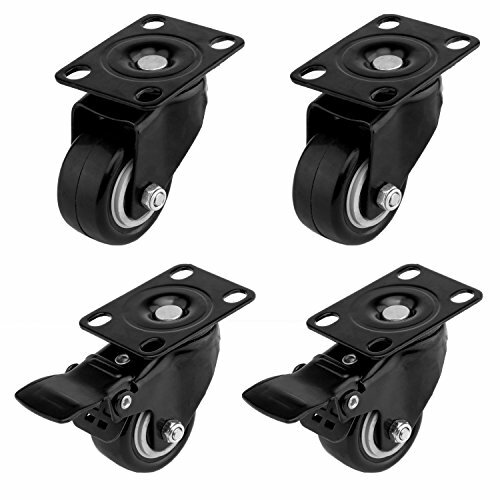 Includes 4 casters(2 with brakes& 2 without).Swivel casters wheels rotate 360 degrees which makes turning the mating equipment possible,good for transporting light furniture and displays quietly and safely,perfect for hardwood floor,tile floor and smooth floor. Made of the popular non-marking polyurethane rubber wheels,very quiet running,absorbs shock and vibrations.Heavy duty bearing and strong locking bring a max loading capacity and safety. Perfect casters for small equipment and furniture including ottoman,coffee table,plant stands, bookshelves,shoe bins,toy bins,shopping carts,workbench,underbed storage,shopping carts,kitchen carts,buffet carts,mobile tool carts,dj flight case,work bench,plant mover,trailers,steamer trunk,hand trolley,miter saw band-saw cabinet,planer,trunk,dolly,guitar amp,PA subwoofer and more. WITHOUT INSTALLATION SCREWS.100% lifetime warranty!If you have any question,please contact us. We will reply in 24 hours and 100% money back or replace new if you are not satisified! If you have any questions about this product by Ulifestar, contact us by completing and submitting the form below. If you are looking for a specif part number, please include it with your message.